We have one of these in stock in Green and its size 17″. It is a shop soiled bike with some minor marks on the down tube, hence the price. 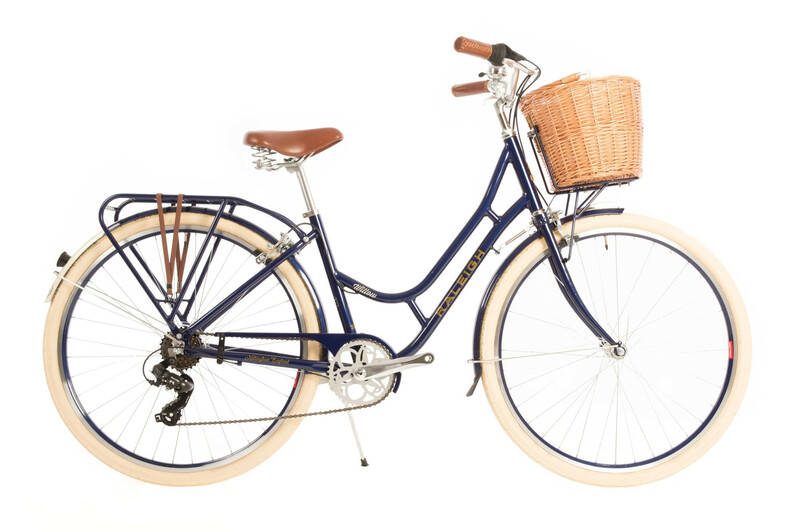 This bike sold out this year however, Raleigh will be making them available earily November ready for Christmas. The 7 speed Shimano Revoshift gears are simple to use with an easy ‘twist’ shifter and Tektro brakes provide safe stopping power. A steering limiter has been added to the bike to provide supported steering whilst you’re riding and ensure that when your bike is resting on its propstand the front wheel doesn’t tip to one side unexpectedly. The bike cables have been routed inside the frame to reduce maintenance, help avoid trapped clothing incidents and achieve a clean ‘cable free’ look. Additionally all of the Willow’s graphics have been carefully sealed under a clear, protective lacquer to keep your bike pristine no matter where your travels take you. Complimentary cream coloured tyres provide an added element of sophistication in addition to their added functionality. The tyres are wider than standard with an increased volume which results in a cushioning effect and provides a smoother, more comfortable ride. Plus these tyres feature a puncture protective layer to reduce maintenance needs and a tread pattern suitable for roads, paths and light trails. The Willow is the ideal companion for your weekend adventures.